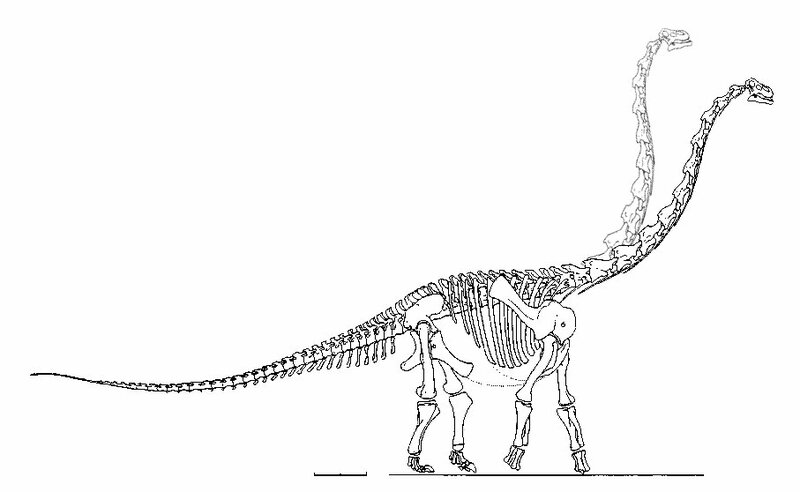 Here’s a skeletal reconstruction of Alamosaurus modified from Lehman and Coulson (2002:fig. 11). I cloned the neck and rotated it a few degrees to see where it would put the head. 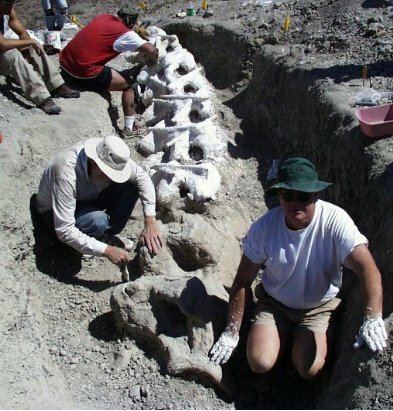 Here are a couple of articles on a giant sauropod found in Big Bend in 1999. This critter is generally assumed to be Alamosaurus but it could be something new (I have no evidence either way); the material is currently under study at the Dallas Museum of Nature and Science. In the second article Homer Montgomery speculates that the complete neck would have been more than 30 feet long. That’s certainly not impossible, since 30-foot-plus necks are known for the largest individuals in several clades (e.g., Mamenchisaurus, Supersaurus, Sauroposeidon, probably Puertasaurus, possibly Futalognkosaurus, but probably not Aegyptosaurus) If so, then you could just about double all of the proportions from the first individual described above, which would give a truly prodigious animal. The 52-foot animal probably had a mass around 15 tons, so the 79-footer would have been about 50 tons (1.5^3 = 3.375), and the hypothetical 100-footer would have been 120 tons, which is up in Amphicoelias/Bruhathkayosaurus territory. For what it’s worth, I think the numbers for the 79-foot animal are more plausible, but who knows. Anytime you’ve got a partial neck that is longer than the complete neck of Diplodocus, you’re dealing with a wacky big animal. Lehman, T.M. & Coulson, A.B. 2002. A juvenile specimen of the sauropod Alamosaurus sanjuanensis from the Upper Cretaceous of Big Bend National Park, Texas. Journal of Paleontology 76(1): 156-172. Since you are talking about sauropod size, Matt, what do you think of the recent paper on allometric equations for predicting body mass of dinosaurs (I’m inclined to think they are, for the most part, hogwash)? Mike told me he thinks their estimate is unreasonable for brachiosaurs, but what about titanosaurs? And does this mean that Amphicoelias instead of weighing 120 tons would *only* weigh 60 tons? Also, in the skeletal for Alamosaurus it appears to have 11 or 12 cervicals, yet Rapetosaurus appears to have 15 or 16 cervicals. Did the number of titanosaur cervical vertebrae really differ by that much, or do we not really know how many cervical vertebrae Alamosaurus had (yet)? Briefly: I don’t have much faith in any mass estimation method, even the ones I use! But allometric equations seem to be particularly unreliable. This isn’t just me whinging–Hurlburt found the same thing, in what is AFAIK still the only study that compares the performance of multiple mass estimation methods on individual extant critters of known mass (he also found that the most reliable methods are often off by 20% at least). I feel pretty confident that the HM SII individual of Brachiosaurus massed between 20 and 40 tons in life, and I strongly suspect that the actual number was in the bottom quarter of that range, but there are so many unknowns that narrowing it down any further or with any more certainty strikes me as incautious at best. Now, if I ran the numbers and got, say, 25.5 tons, I’d report that to however many decimal points I could justify, but I try to keep a firm mental distinction between “This is the mathematical output of this function given the input measurements and assumptions” and “This is actually what the animal weighed in life”. In other words, I make use of the output of mass estimation methods–and phylogenetic reconstruction methods, and posture determination methods (how else can I do science? )–but I try not to mistake them for the truth (how else can I do honest science?). IMHO, people who accept the results of these things uncritically are just as deluded as people who reject them uncritically. If you want to make progress, you’ve got to do the best you can without getting fanatical in either direction. That said, if there’s an allometric equation that predicts only 60 tons for Amphicoelias, then I will probably pay it even less attention than normal, asymptotically approaching zero. The primitive number of cervicals in titanosaurs is not known for sure, but Gomani made a pretty good case for 13 based on Malawisaurus. Cervical counts are pretty plastic in sauropods in general and in Somphospondyli in particular, so who knows. More cervicals would change the estimated neck length for Alamosaurus but would have negligible impact on the mass (like maybe 1-2% max). I always thought alamosaurus was a puny sauropod, but now i have a new found respect for this beast. If a creature that is assumed to be 52ft (was the original specimen a dwarf) then ittranspire’s to be 79ft or more who’s to say that the one or two species of argentinosaurus or supersaurus weren’t the “ronnie corbetts” of there species. In any case it’s unlikely they were the “peter crouches”,i’m sure as far as sauropod sizes go we ain’t seen nothing yet! Well there’s wiki if anyone didn’t understand those reference’s. Anyway last week whilst looking for picture’s of supersaurus I stumbled acrossed your site and have been reading through all your topics and i have to say it’s made for fascinating reading, its nice to know that someone out there finds sauropods as interesting as i do or even more so. I do agree with you that brachiosaurids are the most spectacular of all sauropods because of there magnificent height although they have a somewhat stumpy tail (compared to diplicids anyway),which leads me to ask is there likely to be a full size cast of sauroposeidon based on an upscaled brachiosaurus anytime soon (argentinosaurus and supersaurus do from only a few bones discovered). I mean everyone gets excited over that 40ft girafftitan so imagine the gasps when gazing up at a a 60ft plus monster, it may not be correct but it would give dino-mad people like me an idea of its lofty splendour. Just to say thanks for all the wisdom youv’e given to sauro-nuts like myself. Hi, Peter, welcome aboard! Sadly there are no plans for a full-scale Sauroposeidon cast; and although I said “sadly” I have to admit this is as it should be. We do only have a segment of neck, about a third of it. Not really enough to make a whole-body skeleton from. If you’ll indulge me, I’d like to throw in a couple of niggles. First, please do not use apostrophe’s for your plural’s. It gives me the screaming heebie-jeebies. For more on apostrophe use, see the incredibly helpful page at http://sagp.miketaylor.org.uk/faq.html . And second, remember that genus names like Supersaurus and Sauroposeidon always get a capital letter and are written in italics. Ah … sweet, sweet pedantry. It seems, from what I know of titanosaurs, that Alamosaurus may have been heavier than what is predicted. Its body is wider than most earlier sauropods, allowing it to carry more weight, as well as having more weight due to being wider than earlier sauropods. It, also, may have had body armour. Yes, titanosaurs tend to be wider-bodied than other kinds of sauropods. But the mass of “armour” would have been negligible. I think that a good way of determining the weight of a sauropod, among other ways, is to measure the density and width, circumference of its leg bones. A titanosaur may be a little shorter than a diplocid, but heavier than the other sauropod. It was usually wider, thus, heavier per its length. This approach has been used a fair bit, notably by Anderson et al. (1985) to get mass estimates for a variety of dinosaurs, and Russell et al. (1980) to get their ludicrous estimate of 14.9 US tons = 13618 kg for Giraffatitan. This latter result shows the problem with estimating mass by limb-bone allometry: it grossly misrepresents the masses of animals with unusually gracile or robust limb bones. It’s well known that brachiosaurs had the most proportionally gracile humeri of any sauropod — see for example Taylor (2009:796), and so any mass estimate based on shaft thickness is bound to underestimate. Methods involving direct measurement of volume (e.g. by weighing models or performing a GDI) are better. Anderson, J. F., A. Hall-Martin and Dale A. Russell. 1985. Long-bone circumference and weight in mammals, birds and dinosaurs. Journal of Zoology 207:53-61. « Four complete, articulated, extant sauropod skeletons — yes, really!